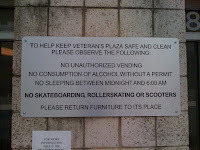 With a new skate spot opening in Woodside Park this Friday, the Silver Spring Regional Services Center decided this week to ban skating in Veterans Plaza after complaints about noise and property damage. The Regional Services Center made the decision after a meeting last week in which local residents, community leaders and skateboarders discussed uses of the three-week-old plaza. "We want our skateboarding community to embrace Veterans Plaza," writes Reemberto Rodriguez, director of the Regional Services Center, on his blog. 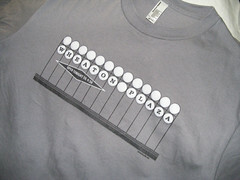 "However, the activity of skateboarding itself is simply not an acceptable activity on the Plaza." "Definitively an issue," writes Reemberto Rodriguez, director of the Silver Spring Regional Services Center, in an e-mail to JUTP. "It is a balancing act between how to be welcoming of all activity that brings the Plaza alive with the charge to keep it clean, safe, and in good condition." He notes that he's seen a "very positive reception" to skaters from other people in the plaza . . .
"I am in conversation with the skaters - and many others - to see that we do this in a way that is respectful of all," writes Rodriguez. Skaters in Veterans Plaza last week. The assault of a 32-year-old man next to the plaza two weeks ago led many to point fingers at skateboarders. Though one of the individuals charged in the attack, Dante Chriss of the District, is seen with a skateboard on his Facebook profile, there's no proof that Silver Spring skaters who use Veterans Plaza on a regular basis were involved. With the new policy in effect on Monday, the plaza was eerily quiet despite the nice weather. Anyone entering the space with rollerblades or a skateboard was turned away by a security guard. Even young kids with toy skateboards were forbidden from using them. While in the plaza, I spoke to Gwen Haney of the Silver Spring Regional Services Center, who says that reality stifled their good intentions. "We tried," she laments. "In the beginning, we were sympathetic to them and their need for a place to go. It didn't work out." "I've heard some complaints," she says. After spending time in the plaza, she began to see what people were saying. "I came out and sat. It can get irritating," Haney notes. "I heard the thumps." There was also considerable damage to the plaza caused by skaters, she claims. Haney points to multiple handrails that have been marked up. She suggests that the open concrete area where an ice rink will be installed this winter was also harmed by skateboarding, though there weren't any visible impacts she could show me. 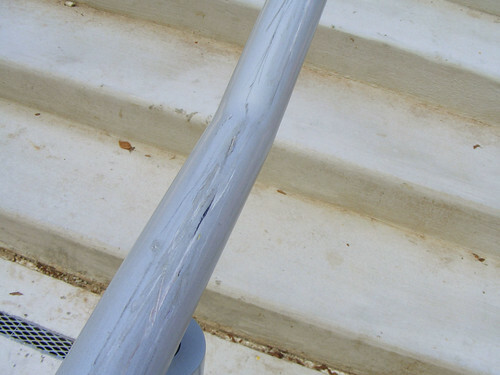 Handrail damaged by skating in Veterans Plaza. I was told that skaters were allowed to skate there as long as we just skated the ice rink and we didn't grind or mess up the benches and what not. i complied with that and so did many other skaters who usually skate down in dtss. but now it wasn't until all these other people came and started skating and decided that it was a good idea when others and myself told them not to. In a flyer being handed out by security guards in Veterans Plaza, Rodriguez suggests that skaters start using the new skate spot in Woodside Park a half-mile away, set to open on Friday. While it will be the first dedicated space for skating in the area since the East of Maui skatepark closed in 1998, figures from advocacy group Skaters for Public Skateparks suggest that it won't be nearly large enough to accommodate the local skater population. 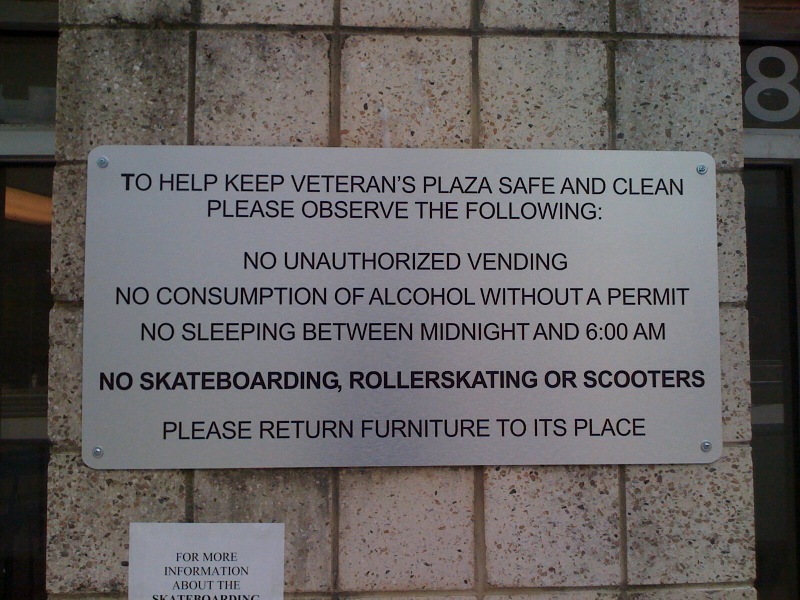 Nonetheless, Haney says, that doesn't give skaters the right to use Veterans Plaza. "This wasn't designed as a skatepark," Haney explains. "It has to be regulated. There has to be a way to prevent any danger." The Regional Services Center will hold a meeting to discuss the new skateboarding policy and "where we go from here," as Rodriguez states it, tomorrow night at 6:30pm at the Civic Building, located at Ellsworth Dr and Fenton St in downtown Silver Spring. I take issue with Gwen Hanyey's claim that "they tried" -- if trying means having different people tell us different rules on an almost daily basis, and refusing to put anything on the web, where skaters could actually find the rules, then sure, they tried. Reemberto and I have been in touch for many months about skateboarding issues in Silver Spring. But he didn't send me an email letting me know the rules, so that I could let the kids know. One day when I was at Veterans Plaza, he wouldn't say a thing about the rules or whether or not we'd be able to continue skating there. He told me he was there that day "as a civilian." I don't know what skaters he's been in conversation with regarding skating at Veterans Plaza, because not one skater could tell me Reemberto's name, and he never spoke to me about any of these issues. 7 skaters can use Woodside at one time. Does Reemberto really want the 100 or so Silver Spring skaters to all go to Woodside Park in hopes of being able to skate, when the vast majority of them won't be able to? 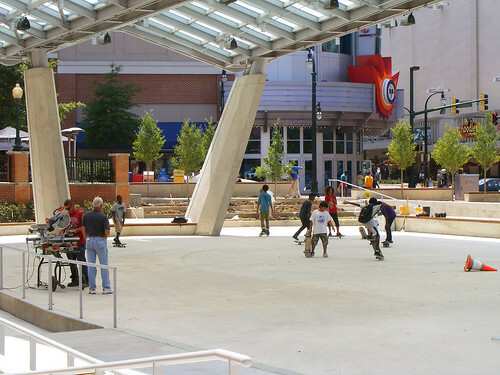 Silver Spring needs a dedicated skate park (or maybe a few smaller parks with different designs to spread out the skaters and the locations). I don't have an issue with skaters being banned from the plaza. It wasn't created for skateboarding, and skateboarding will not add to the value of the plaza. I do have a problem with the county banning the activity without providing a viable alternative. The issue really is that the plaza was up for only a few days or so before visible damage from skateboarding was seen. If you're a county official or tax payer (and skateboarders are generally tax payers), the fact that something that cost that much and could mean that much to Silver Spring was damaged so quickly was irritating. Who knows what 10-20 years of skateboarding would have done to the plaza. Cities don't create plaza for skateboarders. That's what skate parks are for. I haven't been in the Silver Spring area that long but I can clearly tell you that there is a lack of programming and activities for teens. There needs to be more than just a skate park. There should be a youth center and there needs to be more basketball courts and baseball fields. It's clear as day that one of the major reasons that we have issues in DTSS, especially Ellsworth, is that these kids have nothing to do. It would seem rather simple that the solution is to give them something to do. It's a shame that the Plaza was closed to skaters so soon. While I'm one that generally finds skating in public places (outside of intent) to be annoying, I spent a good deal of time there over the last few weeks and believed that the (mostly) kids skating there were neither bothersome nor did they seem to be damaging any property. Also, when I took my daughter to the park at Woodside last night, 7/26, skaters were already using the skate park. While it's unfinished and still fenced, it can clearly be used. If last night's numbers are any indication, skaters are innovative enough to find ways for more than seven to use it at a time. Still, the area clearly needs more, and larger, areas for skateboarders. Patrick, I agree with you. Before construction was completed, neither I or other local skaters had any reason to believe we would get to skate Veterans Plaza. The fact that we were allowed to was a complete surprise, but skaters were told very directly that they could skate there, as long as they didn't skate the wooden benches. That was the first set of rules. The rules changed almost daily, and from the very beginning, we were also hearing that we wouldn't be skating there for long because they had plans to put up 'no skateboarding' signs. According to a member of the Urban District, they were "working on it." So it seemed like we were being allowed to skate only because the signs hadn't been made yet. That was certainly my impression. But Veterans Plaza became something amazing. A place for kids that's safe and visible, a place where they could show off their skills and feel appreciated. And a place where families clearly enjoyed bringing their children to watch the skaters. I understand the concerns about damage. I only wish more people would understand my concerns about these kids. In a time when we're having so many problems with teens, these are kids who are involved in something constructive. Skateboarding is extremely difficult, and it takes incredible determination and persistence (and talent) to get good at it. Silver Spring has exceptionally talented skaters. But these kids get frustrated when they can't progress like they want to, because it's very difficult to excel at skateboarding if you don't have a good place to do it. Yes, Veterans Plaza has been nice. But we wouldn't feel so bad if we had somewhere else to skate -- Woodside can only accommodate 7 skaters. These are mostly kids who cannot afford camps (privately-run or county camps), yet they're involved in something healthy and positive -- something that keeps them engaged in the pursuit of excellence. Regarding Woodside Skate Spot, I just want to make clear that there's a very real concern about overburdening this park, because that could cause us to lose it. There was and continues to be a lot of resistance to Woodside Skate Spot among Woodside neighbors. There are some who support it and many who don't. The community has asked the county to review Woodside Skate Spot 1 year after it opens, and every year after that. If the community isn't happy at any of those reviews, they'll be able to ask for the park to be closed. My fear is that if we try to cram every local skater into this tiny skate spot, there could be a negative impact on the surrounding neighborhood and it could cause us to lost the park. But many more than 7 will skate at once, potentially creating an unsafe situation. Perhaps the first priority will be to make Woodside bigger. But until then-the skateboarders could us local school parking lots, after hours, weekends and during the summer. When I was young we use to skateboard at Sligo Jr. High School. There was plenty of room. We also played softball, basketball, handball, and football. these skateboarders can find a place to skate without bothering other people. Bob that's not true -- skaters get kicked out when they skate on school properties. You've quoted from the comment by Alexander Terc twice now, and both times, you conveniently omit some of his choice words: "now start thinking with your brains and get your heads out of your asses and understand that what others do, doesn't mean that the leaders are responsible for." While I get Alexander's point, he certainly underscores why many people don't like skateboarders: many of them have little or no respect for others. Telling the taypaying adults of MoCo to get our heads out of our asses -- what a good way to basically confirm existing stereotypes about skaters. John, you are mistaken, I didn't once quote another skater, not Terc or anyone else. And if you want to have a conversation about Terc, I suggest you first have a conversation with Terc, and possibly reserve your judgments until you at least know something about this young man, and about his life, and his challenges, and why skateboarding means so much to him. And you can also ask him about being an avid skateboarder in Silver Spring, with no legal place to skate for a year and a half, or about the meetings he's attended, or the emails he's sent, or the blogs he's commented on, in an effort to try to change that. I was referring to this blog (i.e. Dan Reed), which has quoted Mr. Terc twice (not to your posting). 1. This blog has selectively quoted him twice, and in doing so, has omitted some rather insulting language. 2. His words confirm stereotypes about skaters. Are those stereotypes justified? Maybe or maybe not. 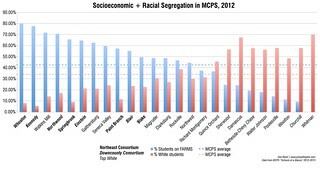 But the point is that the stereotypes exist, and Mr. Terc's comments reinforce them. I do not know who would be chasing skateboarders off school property during the summer or during off hours. The parking lots are empty. I do not see how skateboarding in an empty parking lot could bother anyone. Bob, for the past year and a half that we have not had a single legal place to skate in Silver Spring (after losing Ellsworth), we have asked for anything -- a back alley, a parking lot, a closed off street...any place where kids can skate and not get kicked out. What we got is Woodside...where 7 kids can safely skate at one time. The rest of Silver Spring's skaters continue to have no legal place to skate. For the love of God why are we spending so much time on skating? DTSS roads look like hell and I honestly feel we need to focus our attention on much bigger projects like changing the entire makeup of DTSS. I recently paid my first visit to the Rockville Town Center and was pleasantly surprised to see an entire different scene which was an adult more upscale family environment. DTSS in comparison is more like a circus atmosphere with scores of clowns just hanging out. The food in DTSS is all on the same scale as McDonalds etc. Clearly the entire area was never really well thought out from the start. Shame on you Montgomery County DTSS could have been a gem but at this point its nothing more then a hang out for teens. I like Rockville Town Square. I worked in a store there for 16 months and I enjoyed getting to know the area. But it is a different animal than Downtown Silver Spring. You might have a problem with the quality of the shops there — many of which are also in Rockville, of course — but there are certainly a growing number of upscale stores and restaurants throughout the CBD. But the demographics are different, and we have to respect that. And if you don't think there are knucklehead kids in Rockville, you certainly aren't looking hard enough. I thought the downtown Rockville area was largely cobblestone? Not to mention there is a City of Rockville Skate Park a mile away. What I don't understand is; if people knew there was an issue with skaters in DTSS, why didn't they budget an extra $50,000(? ), $100,000(?) to get a proper skate park built in the area. Instead, they now have to pay for the inevitable repairs, and for a guard to tell the skaters to move along. I haven’t see seen the Woodside spot yet, but it sounds like 0 effort was put into it being a success; either it is too small to handle the population of skater and the “overflow” end up back in DTSS, or it is overly crowded leading to injuries and damage to the spot. Whichever happens will lead people to say “see, we gave them something and they aren’t using it, or they wrecked it”. I bet if all these skaters wanted a baseball field built, community leaders would be lining up to support them. Dans Blog, apparently for you, teens aren't members of families, and their needs are not important. You say DTSS looks like a circus because teens hang out there? What a wonderful attitude to have about our community's most valuable treasures -- our kids. I'd much rather hang out with teens than with people who need more 'upscale' environments in order to feel comfortable. Silver Spring has loads of teens and lots of poor people. Deal with it. Stephen, people have known about issues with skaters in for years. Skateboarding has been huge in Silver Spring for over 25 years, and this is why the Planning Board included a downtown skatepark in the Sector Plan in 2000 -- in part, to protect downtown development from damage, because if skaters had an actual skatepark, we would not be having these conversations. And the county did spend an extra $75,000 on Woodside Skate Spot, but as you said, very little planning went into it, since they designed and built it with zero data on how many skaters there are in Silver Spring, and how many this skate spot needs to serve. The scenario you described, with Woodside failing due to overuse, is the exact reason that the publishing director of Skaters for Public Skateparks explained (in a comment on this blog), that the concept of a skate spot is not meant to replace a larger community skatepark, and that when "budget-minded bureaucrats" try to use it for that, it becomes overwhelmed, and the very people the skate spot is meant to serve, get blamed for the overuse and become victims of the bad planning. We met with the director of the Civic Building last night, and after about 40 skaters came out and spoke up, I'm expecting there to be some movement on an additional skate spot very soon.